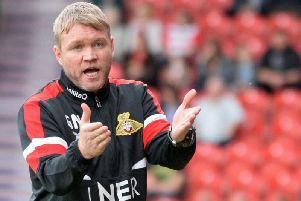 BEN WHITEMAN is hoping he can continue to fire in the goals for Doncaster Rovers after agreeing a permanent deal with the League One club today. The 21-year-old scored seven goals in 30 appearances during an intial six-month loan spell before returning to parent club Sheffield United at the end of last month. But manager Darren Ferguson was keen to bring the midfielder back on a permanent basis and, after agreeing a six-figure sum with the Blades, Whiteman has signed a three-and-a-half year deal. Once it became clear Rovers wanted to bring him back on a long-term basis, Whiteman said it was an easy decision for him to make the switch. “I’m made up to have signed for this club permanently,” he said. “We’ve managed to get it all sorted fairly quickly and my aim was always to get back here. “I enjoyed my loan spell and that’s what made me want to come back, it was an easy decision to come back here once the offer went in. Whiteman is Rovers’ joint top scorer in all competitions this season, and is looking to increase his tally between now and the end of the season. “I’ve scored a few goals in my time here so I want to keep improving on that,” he added. The influence of manager Ferguson wsas another major factor in Whiteman’s willingness to return to the Keepmoat. “The manager has been great for me, he developed me and allowed me to express myself which was one of the biggest reasons why I came here in the first place,” he said.